With proper care and feeding, you can easily keep house plants healthy in your home. House plants contribute a lot to your home: beauty, serenity, even oxygen as they go about their daily growth and flowering. But their need for constant care can also be a drain on your time. Can you keep house plants healthy and vigorous even if you can barely spare a minute to care for them? 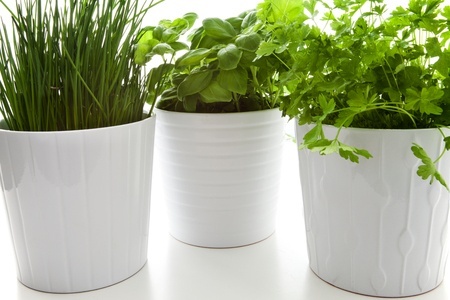 Yes - here's how to keep house plants healthy in your home. First, keep only those house plants that you truly enjoy, and that do well in your surroundings. If your house is dark and shady, for example, stay away from all cacti and other sun lovers - in low light they'll grow spindly and misshapen. If you're often out of town, avoid plants that need frequent watering, such as ferns - they will die of thirst. The tag in a new plant's potting soil can help guide you as to how much light and water the plant needs. Take a similar approach to plants you keep out of habit. If that scraggly cutting from Aunt Agatha's rose geranium refuses to prosper, add it to the compost; she'll forgive you. If the potted azalea that sat on your desk at your hated old job makes you miserable when you look at it, toss it. Own fewer, larger plants instead of a lot of smaller ones. They'll make a bolder statement, and you won't need to spend as much time caring for them. To make plant care easier, keep plants in the part of the house where they'll do best: Gather those moisture-loving plants in your humid bathroom. Then, group plants that prefer life on the dry side on the same sunny sill. That way you won't harm some as you try to keep others alive. When it comes to watering, don't kill plants with kindness. Most actually need to dry out a bit between waterings because their roots draw air from pockets in the soil. If the soil is constantly waterlogged, the plant will suffocate and rot. To avoid this, wait to water until the top of the soil dries to the liking of each type of plant. Then water thoroughly and dump out any excess that drains into the saucer. Instead of dusting leaves by hand, place plants in the sink and gently spray them with water. Or, briefly set them in the tub under a cool (not cold) shower until the leaves are fresh and clean. While your houseplants are actively growing, occasionally pinch off the last few leaves' worth of new stems; the plants will produce bushier, more luxuriant growth. Next: 6 Houseplants You Can't Kill.